The Messages tool removes the clutter of messy email chains while maintaining a centralized record of all conversations with files. There are 2 kinds of messages that one can have in an space: Visible and Hidden from Watchers. Visible to Watchers: These are public. Messages are created Public by default unless they are specifically marked as Private (Hidden from watchers). Public messages are viewable to all watchers and Public watchers. Click on the "Visible to Watchers" link on the left to see the list of Public messages. Hidden from Watchers: These are Private. If you want to mark your message private in order to hide it from watchers, Public watchers and non registered users, you will need to select the "Hidden from Watchers" option while creating or editing a message. Click on Start a discussion at the top right. Enter a Subject and add a message. If you want to add attachments to your message, click on the Add attachments link and upload your file. 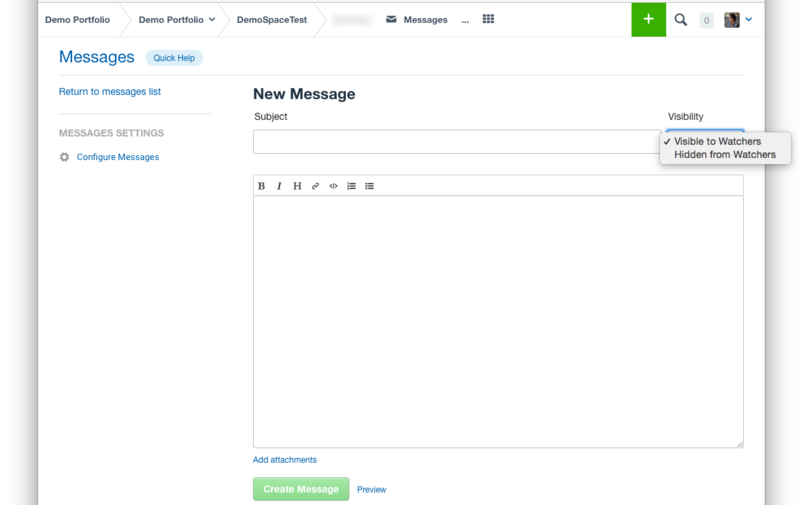 Before submitting the message, you can preview your message by clicking on the Preview link. You will see how your message will look once submitted. Finally click Create Message. The message will be created successfully. How Do We Alert Users When a Message is Posted? When a message is created, the members of the team receive an email alert. If you create or edit a Message comment and mention someone (For example - @userlogin), the mention is sent to that user and an email alert is also sent. Note: In order to receive an email alert regarding Messages, please make sure that the user selects "When an event happens" for Messages in the Stream > Email notifications page (https://www.assembla.com/spaces/space_url/users/alert_settings). To learn more about email alerts, please check out our Configure Email Alerts article. As an owner you can choose how members of your team will be able to access this tool. You can give them All, Edit, View, or None permissions on the tool.